Ireland, the former Celtic Tiger gets bitten by the crisis. What I’ve been thinking for some time. Economics, particularly the mainstream analyses, has lost it’s way. The failures of the current crisis point out failures of economic advice and policy making. Those policies were based on models & theories that have a flawed methodology. The “positivist” methodology of economics and it’s accompanying physics envy dating from the mid-2oth century has led us astray. “The Financial crisis and systemic failure of economics” – Mark Thoma. 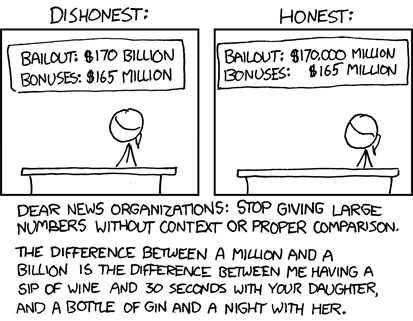 The furor over AIG bonuses, while justified and right, is further evidence that the US media, public, and politicians have failed their math and arithmetic. The REAL story should be the $140 Billion in AIG bailout money paid to counterparties like Goldman Sachs and Deutsche Bank. Instead we get the outrage over 0.1% of that amount. How did banking get so screwed up? One of the best articles I’ve found on how the banking industry & Wall St got so screwed up that they could take down the world’s economy. It’s very long, but an easy and engaging read – you don’t have to be an economist to understand it. Warning to the sensitive: it’s from Rolling Stone, so some of language is a bit salty. Check it out here at: The Big Takeover.